So here we have landed in the year twenty ten. I could whine about how cold it is here in the Blue Ridge Mountains but a quick look at The Weather Channel's map shows others farther north are suffering far worse. 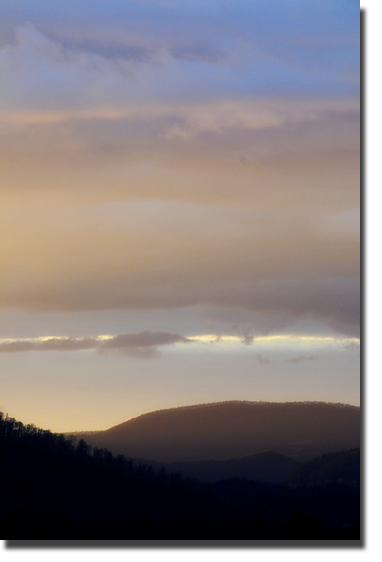 Yesterday I bundled up, packed my Nikon and Annie into the Jeep, and went for a ride around Valle Crucis. The wind was fierce, though the sun was reflected through the glistening veil of blowing snow. I visited the Taylor Farm where I gave the outdoor residents, Mr.Horse and Mr. Donkey a bit of camera love. Poor Mr. Donkey quickly became my favorite as Mr. Horse repeatedly nipped and head butted his rival out of the way. That, and when I was on my knees taking Mr. Donkey's photo, the horse bit my hat off and I'm a sucker for taking the side of the under dog. I was fortunate enough to be invited up to Grandfather Mountain the other morning with the hopes of capturing the previous evening's snowfall clinging to trees. However, high winds knocked the snow off the trees so my preconceived notions were left unfulfilled. Still, I was on top of Grandfather Mountain and hello, how awesome it that? The road was ice covered but my Jeep's wheels didn't slip as it chugged up the steep winding road. Just before Forrest Gump curve I thought it wise to park in the picnic area and test the condition of the road with my feet before climbing any higher in elevation. As I got out of the car, my feet slipped and just about that time I looked up to see a pick-up truck filled with construction workers sliding backward. I've never seen folks bail out of a vehicle faster. The truck stopped on its own. Both the vehicle and the dudes were fine. They were so relieved to see me. "Hey, you must have 4-wheel drive," said one of the fellows. Just then, I noticed a tiny sliver of sun rising on the horizon. I waved them over. "Come check this out," I said. We perched on a boulder, bundled up in our coats to shield from the wind, and looked eastward for a few minutes of bliss. So that is how me and 3 guys from South Carolina welcomed in our Tuesday. Payday has arrived for those of us who have weathered the many bitter winter months. Though the forecast calls for snow next week, I'm going to put my fingers in my ears and sing "La-la-la-la-la," and pretend I don't know any better. I saw this backlit cherry tree backlit along Hwy. 105 as I drove into work this morning. I gleefully stopped my Jeep and snapped a photo. Score! A barn, a mower, an outhouse and autumn leaves all in the same photo. It's this hillbilly photographer's dream come true. All are found on the Dutch Creek Trails property, formerly known as the Baird homeplace, in Valle Crucis. As you can clearly see, the autumn color is forming, but peak is at least another week or two away at the 3,000 feet mark. Gnumoon told me her visit to Beech Mountain over the weekend was looking mighty fine, yet still at nearly 6,000 ft above sea level, the leaves had not reached their finest. Here is the official fall foliage report from VisitNC website. The Fall Color Guy is ASU professor of plant physiology Howard Neufeld. He knows his leaves. My advise: Come up the mountain sooner rather than later. And don't worry so much about gas availability. From what I can tell, the fuel crunch, though still an issue, is diminishing. Remember the Valle Country Fair and Wooly Worm festival happen on Oct. 18th. And here's a tip: If you can possibly arrange to visit the area during the weekdays instead of over the weekend, you will avoid the worse traffic. But do come to the Valle Country Fair and say hello to me. My Eldest returned home this evening, for good. Ba-bye y'all, to the way deep south university. Just now I kissed her goodnight and gave her one of my hoodies to wear because most of her clothes are still packed away. "It's colder here than in South Carolina," she said in an almost a surprised tone of voice. My Youngest rolled her eyes in response but seemed happily irked that once again she has a sibling roomate to have to work around. Besides, it is her turn to move away next to the same deep south state yet even farther away.